When you have to plan dinner, menu planning ahead of time can be a real time saver and simplify your dinner prep too. I know I’ve menu planned for years since I’ve been preparing dinner. After my mom died, I started to make meals for our family. Having a plan made it easier. Menu planning is a great way to limit your food costs. When there is a plan for a dinner menu, you know what you have on hand and what meals you can prepare. It gives you a guide to keep you from resorting to eating out. When money is tight adjusting the menu by making less expensive meals can keep your grocery spending in check. The menu can be planned from items that are on sale or with what you have already on hand, saving money for the week at the grocery store. The best way to start menu planning is to write down easy meals your family loves to eat. If they love to eat hamburgers and fries out once a week, consider adding it to your list and making that meal at home instead. I’m sure you can come up with at least 7-10 meals your family already loves to eat. As you think of more meals your family enjoys eating add them to your master meals list. You can do this on paper or in a spreadsheet on your computer. I like to sort my list by the meats I need for the meal, such as chicken, ground beef, pork, steaks, ham, egg dishes, and meatless. By having my main meal list sorted by the type of meat, I can easily pick meals to make when I see a good sale on that type of meat. 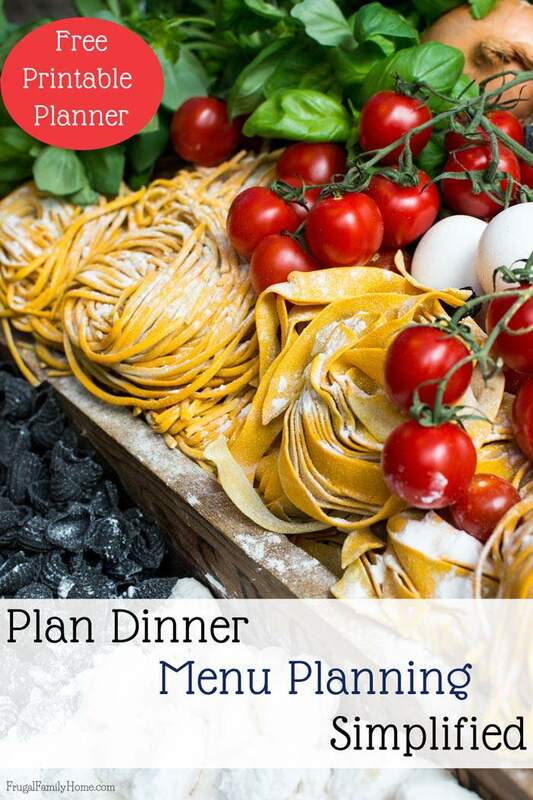 Some homemakers like to make a menu plan each week that follows a set schedule. Something like, Monday is meatless dish, Tuesday is chicken, Wednesday is ground beef, Thursday is pork, Friday is pizza, Saturday is stir fry, and Sunday is a crockpot dish. Make a plan that works for you and your family and one you can stick to also. If cooking every night is too much, consider adding in one night for eating out or double up the amount you make a meal or two during the week. That way you’ll have enough or an extra meal or two later in the week. Once you have your list of dinners or meals you’ll be making for the week, it’s time to shop. Be sure to shop you cupboards, refrigerator, and freezer first. You might find an item that needs to be used up so it doesn’t go bad and you might need to alter your menu plan to accommodate it. I know if I have a lot of veggies in the crisper drawer, I will plan to make a stir fry dish to use them up before they can go bad. If you have a bunch of odds and ends of leftovers in the refrigerator you might want to plan a leftovers dinner, where everyone can choose a different meal to use them up. Adjust your meal plan as needed to fit what you have on hand. Now it’s time to add the items onto the shopping list you will need from the store. If you only plan dinners be sure to make sure you have items for your breakfasts and lunches too. Make a well-detailed shopping list and stick to it. If you forget something, see if you have something else that can be substituted instead, to save the trip back to the store. I like to plan my side dishes to be similar during the week. If I want rice for a side dish for two nights this week, I will make enough rice for both meals and save me time on the second meal. We eat lots of salads since I can usually find lettuce on sale at the discount grocery store. When I get the lettuce home or when I’m preparing the first salad of the week, I’ll wash enough lettuce for the whole week and store it in a zipper bag in the refrigerator. The little bit of extra time spend ahead of time makes getting the salad prepared so much easier right at dinner time. Cooking or preparing vegetables once for the whole week makes it much easier to incorporate fresh vegetables into dinner. On the days I will be making stir fry, I’ll prepare the vegetables when I have a little down time in the middle of the day and place them in reusable containers. If you work outside the home it could be done in the morning or the night before. Then when I’m ready to make the stir fry. I just add the vegetables to the skillet and cook. All the prep work has been done. Making for a really fast meal. For this menu above on the first night we have mashed potatoes, I’ll make enough for the rest of the week. The same goes for the rice as side dishes too. I wash enough lettuce early in the week for all the salad, but I don’t cut the leaves until I actually prepare the salads. I also add any topping at the time I’m making the salads so they don’t go bad. I’ll need french bread for two meals, so I might make two loaves of french bread on the first day I’ll need it or I’ll purchase a loaf of french bread to have for both meals. Just this little bit of prep ahead of time can make a big difference when you are trying to get dinner on the table quick. If you have never menu planned before just keep it simple. Make a list of 5-7 meals your family loves to eat and make a plan to prepare them this week. Be sure to give yourself grace and if you don’t feel like eating the meal you have scheduled for that day, switch to a different one you have planned. 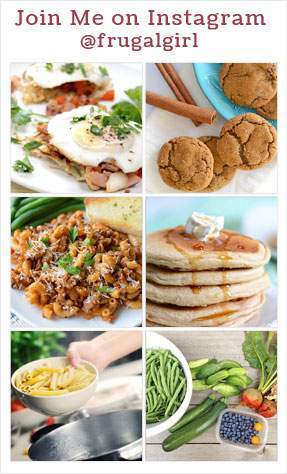 The menu plan is a guide to what you can make but not something you have to stick to rigidly. 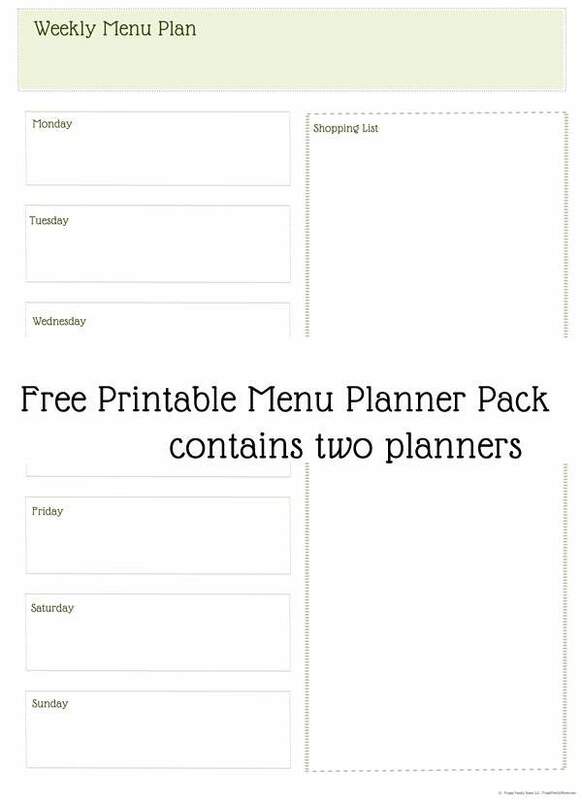 Need a printable menu planner to plan your menu with? I have two you can download for free. Just add your email address below and I’ll send it right out to you via email. One word of caution, If you are not used to cooking dinner each night of the week, be sure to plan a night to have dinner out or order in. If you go from not cooking much at home to trying to cook every night, it could be overwhelming. Take it slow make a small change each week. Soon you’ll be menu planning and cooking at home like you’ve done it all your life. Plus it will be less stress and more enjoyable. What do you currently do for you meals each week? Do you menu plan? I would love to have you share what you do each week in the comments below. Want more menu plan ideas, find my past menu here or find more menu plan ideas at Org Junkie too. Anna, that little change has made a big difference in how much we eat out. My son even now likes the homemade hamburgers and fries better than eating out. Your menu planning printable is great, Shelly! I’ll confess that I’ve gotten out of the habit of menu planning each week. I used to do it on Sunday nights, and then just stopped and kept putting off getting started again. Glad it inspired you, Sandra. I know when I get out of the habit of doing something it can be hard to restart. Such great tips on meal planning! I started meal planning about a year or so ago, and it has helped dramatically! I usually plan on one Mexican meal, one Italian meal and one breakfast meal for dinner each week, then fill in the gaps with other family favorites. I also make sure to check my local store’s circular online so that I can see what meats are on sale, so that I know what to make that won’t cost a lot, and plan dinner around them. 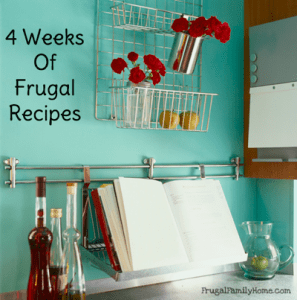 Meal planning has helped us save money both on groceries and on eating out! 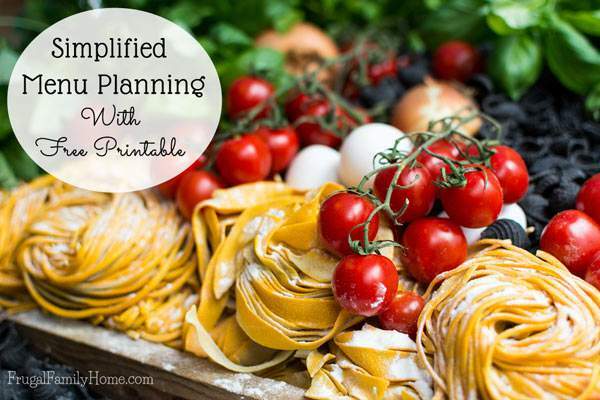 Sounds like you have a great plan to get your menu plan filled in each week. We love breakfast for dinner too. 🙂 I agree meal planning really does help to save on eating out and money on groceries. This is awesome! I just started trying to meal plan on a regular basis. I tried filling in a calendar but that overwhelmed me. Not the filling in part, but following up with using it. So I made a binder instead. I used the photo pages that hold 4×6’s and full page covers. In the photo pages I insert meal cards (index cards work great) and the full pages are inserted between each weeks plan with the recipes needed. I also use the one night per week for each meat. It is a work in progress but now I don’t have to make a meal on a particular day if I don’t feel like it or something unexpected comes up. Thank you for the planner and some more simple recipes to add to our meal plan. My next project is to prepare as much ahead of time (like once a month meal prep) so some of the more involved meals can be thawed and cooked. Sounds like you have a great way to meal plan. When you try once a month meal prep, you might try mixing marinated meats where you put just the chicken or the meat in a marinade and freeze then cook the day you’ll be eating it. With pre-cooked meals like meatballs or full casseroles. I usually stock my freezer when I get meat on sale. Such as a when I purchase 40 pounds of chicken from Zaycon Fresh. I’ll prep all the chicken for meals for the freezer. I precook about 10 breasts. I make marinated packets and I cut up chicken for certain recipes. It makes it easy to get meal starts into the freezer in just over an hour. I also do this for pork loin and ground beef when I find them on sale.